↑ 1.0 1.1 1.2 1.3 Turner & Corvisier & Childs, A Dictionary of Military History and the Art of War, pp. 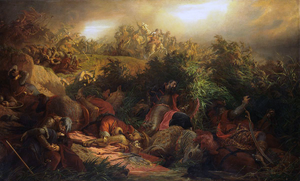 365–366 "In 1526, at the battle of Mohács, the Hungarian army was destroyed by the Turks. King Louis II died, along with 7 bishops, 28 barons and most of his army (4,000 cavalry and 10,000 infantry)." ↑ 2.0 2.1 2.2 2.3 Minahan, James B. One Europe, many nations: a historical dictionary of European national groups, Greenwood Press, 2000. ↑ Stephen, Turnbull (2003). The Ottoman Empire 1326 - 1699. New York: Osprey. p. 49. หน้านี้แก้ไขล่าสุดเมื่อวันที่ 3 กรกฎาคม 2560 เวลา 22:26 น.